.....but Star Frontiers was not on the list. While I didn't get my AD&D, I did get this weird Sci-Fi game that came with two d10's and a couple of crayons. I lived in a very small rural town in Iowa that made getting together to play nearly impossible, but my 8th grade study hall teacher did let me start up a game during first period. That game only made it a week or two, but only because it proved to be too popular. Too many students would rather watch my group play than do their busywork. 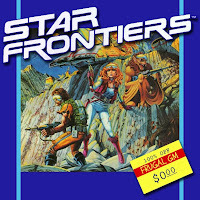 Someday I hope to be able to run me some Star Frontiers as an alternative system for my group...or maybe a one-off or two at a convention. 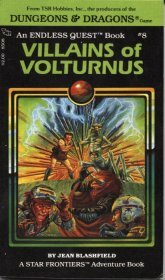 Now if you aren't all too interested in playing Star Frontiers as an RPG, you might still be interested in Quest adventures, which are basically the Choose-Your-Own-Adventure (called Endless Quest™) books converted into HTML. Not a bad way to spend a few hours...assuming your character can live that long.